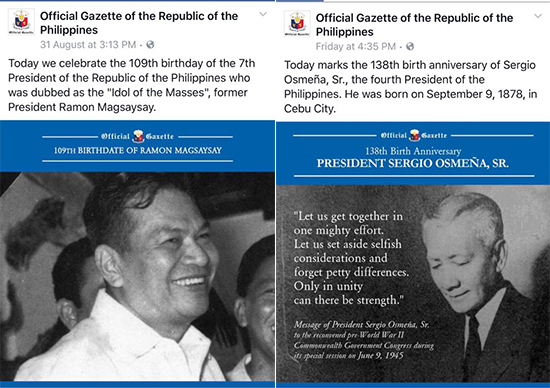 The Official Gazette of the Republic of the Philippines, the designated source of all information from Malacañang, is currently under fire for omitting relevant data in a Facebook post to mark former President Ferdinand E. Marcos' 99th birth anniversary on Sunday evening, September 11. The post has since been revised (again and again) since. 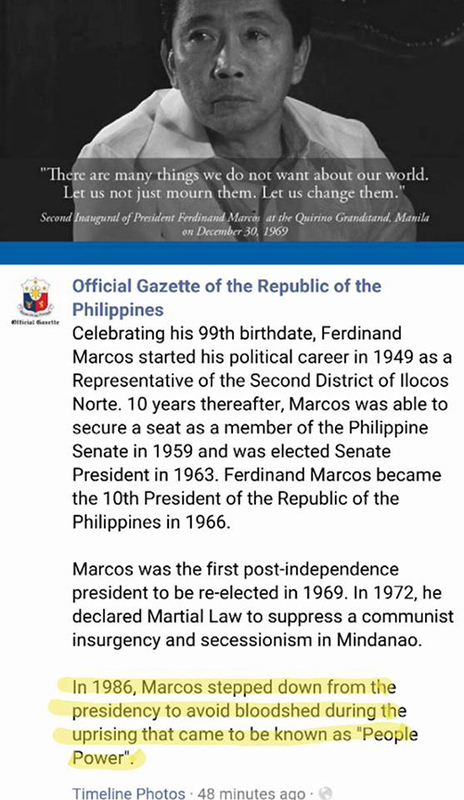 Aside from Marcos' photo, the post bore a quote from the former president's 1969 inauguration speech: "There are many things we do not want about our world. Let us not just mourn them. Let us change them." There was nothing wrong with the post, as all former and current presidents' milestones are highlighted by the Official Gazette. However, people reacted to the statement that accompanied the original post. This passage, in particular, provoked heated reactions: "In 1986, Marcos stepped down from the presidency to avoid bloodshed during the uprising that came to be known as 'People Power.'" 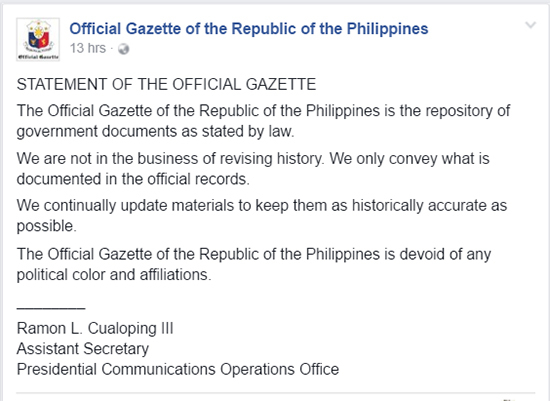 The comments accused the Official Gazette of "historical revisionism." To cite an impartial source, retired U.S. theologian and pastor G. I. William son, defines "historical revisionism" as "the process that attempts to rewrite history by minimizing, denying, or simply ignoring essential facts." 1. There was a suspension of civil rights during the Martial Law years. People were arrested sans warrants and jailed simply for speaking out against the administration. 2. Based on the research by Alfred McCoy, author of An Anarchy of Families: State & Family in the Philippines, 3,357 people were killed; 35,000 were tortured; and 70,000 were jailed during the Martial Law era. 3. There are a number of cases filed against Marcos, his family, and their cronies in connection with plunder. Atty. Jesus Falcis lists the said cases. 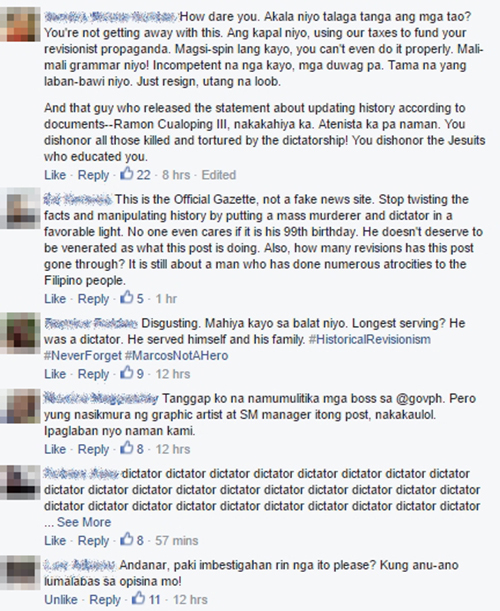 It's worth noting that Falcis identified Marco Angelo Cabrera as the one responsible for the now-viral Official Gazette post. 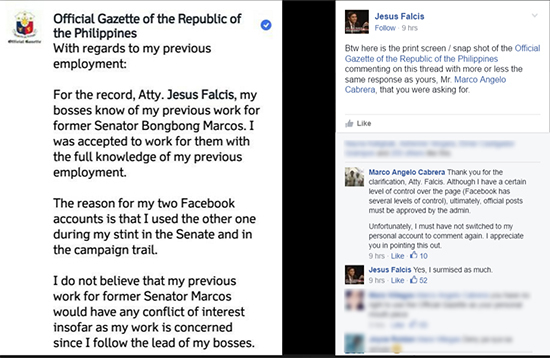 Initially, Cabrera mistakenly responded to Falcis using the Official Gazette account. Cabrera later informed Falcis: "I have a certain level of control over the page (Facebook has several levels of control), ultimately, official posts must be approved by the admin. Unfortunately, I must have not switched to my personal account to comment again. I appreciate you in pointing this out." Cabrera likewise addressed what Falcis had previously pointed out about his possible political leanings. "For the record, Atty. Jesus Falcis, my bosses know of my previous work for former Sen. Bongbong Marcos. I was accepted to work for them with the full knowledge of my previous employment." He added, "I do not believe that my previous work for former Sen. Marcos would have any conflict of interest insofar as my work is concerned since I follow the lead of my bosses. I also had no qualms with those who worked for and supported former President Noynoy Aquino and the way they used the Official Gazette to how they deem fit during the previous administration." 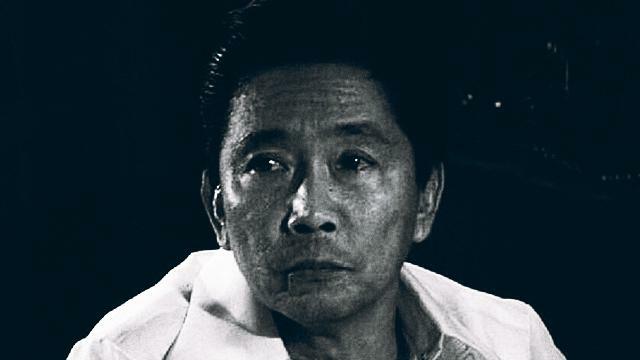 Ramon L. Cualoping III, assistant secretary of the Presidential Communications Operations Office (presumably Cabrera's boss), later issued a statement on the Marcos post. "We are not in the business of revising history. We only convey what is documented in the official records." Cualoping's statement drew flak as well. 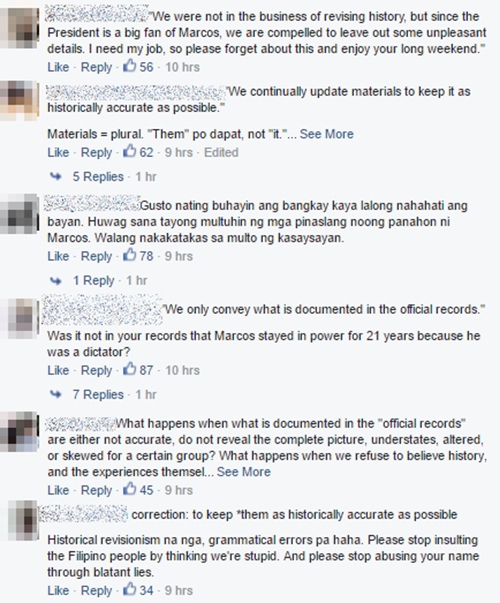 For the record, the Official Gazette later edited their statement accompanying the Marcos post. However, by then, it was too late. The fire had already burned down the house, so to speak. If this edit history tells us anything, it's that you really can't edit what is verified history. Bottom line: Keep those birth anniversary posts short, Official Gazette. Otherwise, you're just going to give people enough rope to hang you with.